AppServices are one of the very cool and helpful new features Microsoft added for UWP apps. They allow your application to provide functionality to other applications without even being launched. This post shows how to add and consume an AppService. The ValueSet entries you are setting up here are the parameters your consumer has to provide. In my sample, I have only a single parameter called 'question', but it works also well with more parameters. After we pulled the parameters out of the ValueSet, we can do the work our AppService is supposed to do. The final step we need to apply is to declare the AppService in our Package.appxmanifest. Declaring the AppService is pretty simple. Just select 'App Service' in the dropdown and hit 'Add'. Give it a name (Microsoft recommends 'reverse domain name style', so I used it). The last step is to declare the Entry point, which is AppServiceNamespace.ClassName (replace with yours). Now, build the solution. If all is set up correctly, you have made an application implementing an AppService. That’s all we need for our AppService. Bonus for the project structure I used: You can provide a Nuget Package for other devs to consume your AppService. How? I will write about this in my next blog post. Even if this is not an MVVM structured app, it absolutely works in there, too. If you want to have a look at a live (in the store) app that uses MVVM and an AppService, click here. 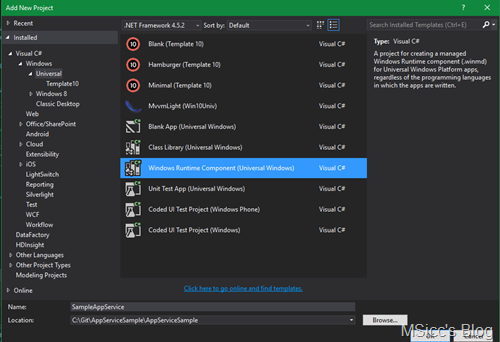 For using the AppService within your app, just download this Nuget Package into your app. Otherwise, I created a complete working sample and pushed it on my Github account right here. Feel free to play around with it to explore AppServices a bit more. As always, I hope this post is helpful for some of you.